Sometimes, life throws you a curveball. Then it chases it with a couple left hooks, uppercuts, and gives you a good kick in the tender vittles while you’re still on the ground for good measure. Just when you think you’ve got it all figured out in life and business – BAM! – sudden, unforeseen circumstances strike, and everything changes for you and your organization. Doesn’t matter what the circumstance is (economic downturn, corporate downsizing, new technology, unforeseen competitor, illness, bankruptcy, death, divorce, etc. ): WHAM! Suddenly, it hits you, and it’s a whole new ballgame. From Apple to AirBNB, LEGO to Lacoste, countless organizations have made multiple 11th hour comebacks. Likewise, endless legions of working professionals hit with unforeseen disaster have successfully engineered second, third, or even fourth career acts. Around the world, every minute of every hour, people with no formal skills or training are doing amazing things – things they were even told were impossible. Literally thousands of individuals learn to overcome mental and physical limitations each day. And the same formula that leaders – and leading innovators – use to succeed in every field? Yep – it can consistently be applied to achieve ongoing success on a personal or organizational level as well: A formula that doesn’t require you to be more rich, talented, educated, or gifted to get ahead either – just more resourceful, clever, and persistent. 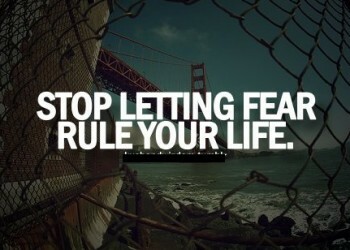 AS WE DISCOVERED THROUGH OUR RESEARCH, FEAR IS THE ONLY THING HOLDING US MOST OF US BACK FROM SUCCESS IN LIFE AND BUSINESS. IN FACT: WE ALL HAVE THE ABILITY TO INNOVATE AND STEER OUR WAY TO SUCCESS IF WE’RE WILLING TO BE MORE COURAGEOUS, MORE PRACTICAL, AND MORE PERSISTENT. All your life, you’ll meet people and competitors who’ll tell you “that’s just the way things are.” But the moment you start believing them? That’s the moment you’ve lost. Having worked with countless leading businesses, brands, and individuals of every age, background, and experience level looking to effect positive change, I’m here to tell you: It’s patently untrue. Fortune favors the bold, and there’s no smarter bet you can make than on yourself. Fate truly is what you choose to make of it. So pardon my French, but [BLEEEEEEEP] all the doubters. Starting right here, right here today, all of us – you, me, the world’s largest brands and corporations – start to happen back. Today, we no longer passively sit back and watch as the future unfolds. Today, we become brave, we become bold, and we become makers, risk-takers, and agents of chance willing to look fortune in the eye, grab the bull by the horns, and create the positive change we wish to see tomorrow. Because today is the day that we’re going to stop predicting the future – instead, it’s the one where we begin to create it. 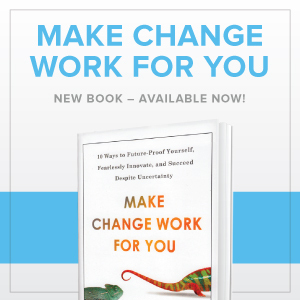 As you may be aware, we recently released a bestselling book titled Make Change Work for You: In it, we made a telling discovery. Specifically – INNOVATION IS BULL****: WE ARE ALL INNOVATORS, DESPITE WHAT ANYONE TELLS YOU. In fact, according to the dictionary, innovation is simply the “introduction of something new.” And as fast-moving and unpredictable as today’s business world is, guess what: Take a second to stop and check your changing schedule and priorities right now, as compared to where they were a day or even just mere hours ago. SURPRISE: Chances are you’re practicing basic principles of innovation and disruption already (!). According to leading researchers at IBM, there are no more static or predictable patterns in business anymore – in their words, continuous change is the new normal. Note that these studies were conducted over half a decade ago: the status quo of “no status quo,” or operating with no standard operating procedure, is now more normal than new. In fact, thanks to vast advances in technology and communications, the next 10 years will bring more change than the prior 10,000. What’s more, evolution is also happening at a blistering clip: Most organizations can now go from conceiving to deploying new services and solutions in as little as 90 days, with 30-day development and production cycles being more common than not. As we also know, unexpected events are continually disrupting markets, people’s behaviors are constantly changing, and new trends are replacing old. In fact, even global multi-billion dollar organizations we work with are introducing new products and services every six weeks for entire years running. Needless to say, the future is anything but predictable. This is what you and your organization are now dealing with, and this is the working world we now inhabit. But what’s fascinating is that as fast as the business world continues to move, and how much the changes we’re already seeing within it will only continue to accelerate, the tools and training we offer modern-day professionals haven’t really kept pace with all these radical new paradigm shifts. In fact, if you look at the working world a little more closely, you’ll notice something telling. Even the world’s most prestigious business schools – who typically offer masters in business administration (MBA), not business change, two very different concepts – are often failing to equip today’s most decorated graduates with the skills they need to succeed in this environment of infinite unpredictability and endless disruption. As a result, the single biggest issue most public and private organizations now face when it comes to leadership – especially with regard to professional training and development – is now often the single most overlooked challenge as well. To be more precise, it’s the fact that we’re continuing to teach people how to solve familiar problems using familiar methods, when it fact we should be teaching them to solve new and novel problems using new and novel methods instead. “The more things change, the more they stay the same.” Sounds familiar and comforting, right? OH, HELL NO. CONVENTIONAL THINKING IS BROKEN. In today’s fast-moving, endlessly disruptive business world, where uncertainty is the only certain and constant change the only status quo, that way of thinking is outdated, outmoded, and disturbingly off-kilter. As we’ve seen in countless arenas from the field of consumer products to technology and education, it’s now imperative to be changing and evolving at a blistering clip. The world moves quickly, and tomorrow is coming on quick – if you want to successfully prepare yourself to greet it, you’ve got to make a point to purposefully disrupt yourself, push your comfort zone, and purposefully color outside the lines on a regular basis. IT’S NOT ABOUT THINKING OUTSIDE THE BOX – IF YOU’RE DOING IT RIGHT, THERE ARE NO BOXES TO BEGIN WITH. As I’d mentioned earlier, forget status quo. In coming weeks, we’re about to rip up the rulebook, rewrite the rules, and rethink what it takes to succeed in tomorrow’s world – even as we explore more successful strategies for innovating and re-imagining the way in which we attack any goal or objective in life or business. Because, honestly, there’s something you should know. Bravery isn’t some natural inborn talent, or special genetic characteristic possessed by only a certain few. As we’ll explore and discuss in the coming weeks, it’s a muscle that you can grow and train – and like any muscle, your ability to be brave becomes stronger the more you exercise it. NOT SO: IF USED CORRECTLY, FEAR CAN BE THE ULTIMATE SOURCE OF CREATIVITY, INNOVATION, AND COMPETITIVE ADVANTAGE. It’s all in how we choose to look at and react to the fears we face in life and business on an ongoing basis. So stick with us, if you’d be so kind – now that we’ve shown you a better way to look at fear, how it has the potential to impact and influence us, and what the seven most common fears in the workplace are, well… Now we’re going to show you how to beat these fears into submission, make them your friend, and transform them into your secret weapon in life and business going forward. Stay tuned for more – we’ve got some fun surprises planned for you in the weeks ahead!! !